Riverfront Drive in Lake Station floods after the Deep River overflowed its banks in this Sept. 15, 2008 file photo. The water was waste high or higher in some areas of Highland during the 2008 flood. Firemen in a boat, in this Sept. 14, 2008 file photo, work with a man with a stalled vehicle on the 5300 block of Buchanan Street. Cars are submerged in floodwater as they exit the Borman Expressway at the Kennedy Avenue ramp in this Sept. 14, 2008, file photo. It was a perfect storm of weather patterns. Rain began falling on Wednesday, Sept. 10, 2008. Then, between Friday, Sept. 12 and Sunday, Sept. 14, the remnants of Hurricane Ike roared up from the Gulf of Mexico to join the debris from Pacific Tropical Storm Lowell and a cold front with three days of soaking rain from the west. From Sept. 12 through Sept. 15, rainfall ranging from 2 to 11.2 inches fell on Northwest Indiana and south suburban Illinois, resulting in massive, historic flooding all along the Little Calumet River, its tributaries and within the Kankakee River basin, according to the U.S. Geological Survey. In its wake, the 2008 flood caused the evacuation of hundreds of residents and $88 million in damage to homes, churches, businesses and infrastructure. 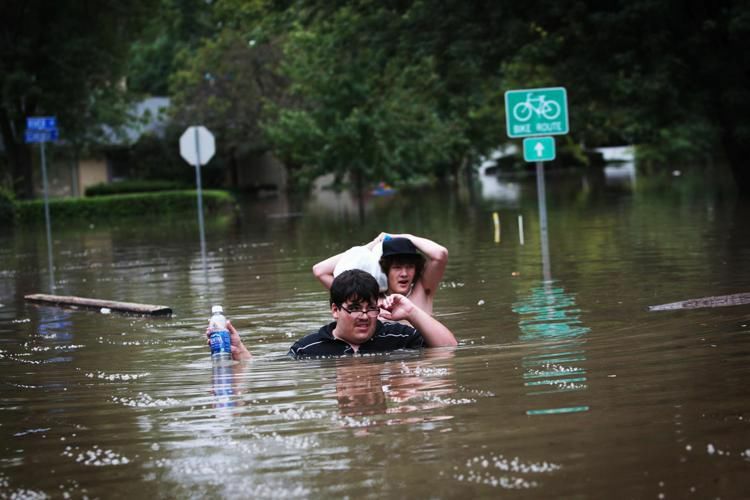 Six counties in Northwest Indiana — Lake, Porter, LaPorte, Jasper, Newton and St. Joseph — were declared federal disaster areas. Particularly hard hit were the communities of Munster, Dyer, Hammond, Highland, Gary, Lake Station, Hobart, Schererville, Merrillville, Michiana Shores, Chesterton, Portage and Porter. That devastation also led to two deaths. At 11 a.m. Sept. 14, Chesterton residents Mark Thanos, 48, and his father, John Thanos, 78, drowned attempting to rescue a 10-year-old boy from a rain-swollen tributary drainage ditch to Coffee Creek in the Westchester South subdivision. The boy survived. John, a retired custodian from Merrillville Intermediate School, and Mark, an English teacher at Wheeler High School, jumped into the creek that ran alongside their Chesterton home after seeing the youngster pulled under the water. The boy was carried by the water through a 20-foot culvert under the street and emerged unhurt on the far side of that culvert. The flooding that invaded Porter County caused the majority of damage in the northern part of the county and into parts of Valparaiso. Portage’s sewer treatment plant also was damaged. Flooding also closed major highways for days, including the Borman Expressway, which was shut down for a week, affecting commerce far beyond the Region. The Indiana Department of Transportation extended its closures and detours on the Borman, rerouting traffic as far west as Calumet Avenue in Hammond, and as far east as Ind. 51 in Lake Station. With the interstate closed, travelers were delayed for hours through rerouted side streets. Commuters tried to get around ultimately stalled traffic in both directions on U.S. 30 in Indiana and Illinois, and on Ill. 394. In Munster, the town upgraded an evacuation advisory to a mandatory evacuation for all residents living in the area between Jackson and Calumet avenues north of School Street. As the flood waters continued to rise, that evacuation order included residents living in the extreme northeast corner of town and those living close to the Northcote Avenue Bridge. The Indiana Department of Natural Resources arrived with boats and evacuated people. Town crews sandbagged the Little Calumet River. Basements began flooding all over Munster on Sept. 13. Homes in Dyer’s Berens-Monaldi and Park View Terrace neighborhoods were among those heavily damaged by floodwaters. Feces backed up in showers and overflowed toilets. Furniture floated in 4 feet of water in some basements. Lake Station’s Riverside Mobile Home property at 3601 E. 29th Ave. had to be abandoned. Flooding so severely damaged Tamarack Hall on the Gary campus of Indiana University Northwest, the building had to be demolished once the floodwaters receded. Across the state line, overflow from the Little Calumet went into Calumet City, which had an earthen dike on its side of the river. At that time, Mayor Michelle Markiewicz Qualkinbush said the city “was right on top of it.” She also said 25 area fire departments came to Calumet City’s aid along with others who helped lay sandbags to try to hold back the river. Lansing didn't suffer as much flooding, because the village had a concrete dike that helped hold back the water. Communities including Crete and Homewood received more than 8.5 inches of rain during that three-day period, according to the National Weather Service. Recovery began in Lake and Porter counties when Gov. Mitch Daniels issued a disaster declaration after he toured the hardest hit areas, including Chesterton and Munster, by boat and helicopter. On Sept. 17, 2008, Indiana Homeland Security Director Joe Wainscott told hundreds of residents gathered at Munster High School’s auditorium federal assistance was a process that would take some time to complete. He said the government would check to make sure people met the thresholds set up by law. Six days later, President George W. Bush declared Lake, Porter and LaPorte counties a disaster area, paving the way for federal and state officials to assist flood victims in a “one-stop” shop. Those agencies providing assistance included the Federal Emergency Management Agency, Family and Social Services Administration, the Bureau of Motor Vehicles, Indiana State Department of Health, Indiana Department of Insurance, Indiana Department of Homeland Security and the Department of Workforce Development. Residents could apply for up to $28,800 in grants for temporary housing and repairs. They also could apply for low-interest loans up to $250,000. The loans are administered through the Small Business Administration, but applied to homeowners. Also in the aftermath, the Lake Area Regional Recovery of Indiana worked with the United Ways of Lake, Porter and LaPorte counties and community groups to gather information to help flood victims. LARRI’s initial $3.5 million grant was awarded in December 2008 through the Indiana Association of United Ways and the United Ways of Northwest Indiana. Two additional grants totaling $11.2 million went to provide case management services for more than 3,600 families, 600 homes restored, five new homes built, and 26 families relocated to new homes, and, in some cases, new communities. The Little Calumet River Flood Protection System dates back 32 years. In 1986, Congress approved the levee project to prevent flooding along the Little Calumet River in Lake County only, supervised by the Army Corps of Engineers. It took until 1990 for the funding sources to be cobbled together. The Little Calumet River Basin Development Commission was established to provide the required local funding match and to oversee operation and maintenance of the levee system. Work began between Clark and Burr streets in Gary. Marshalltown, which lies east of that start point, was finally added. By the time of the 2008 flood, much of that original work in Gary was in disrepair, because no maintenance had been done by the development commission. In fact, the Army Corps had de-certified that portion of the levee, deeming it not adequate to prevent flooding. Flood protection installed in the 1980s along Hohman Avenue also wasn’t maintained. Construction was completed only to Kennedy Avenue by fall 2008. The final stages, from the Northcote Bridge to Hohman Avenue, weren’t even on the drawing board. This wasn’t the first time the Little Calumet River flooded, although it set the bar as the worst flood since the area was settled. Flooding from the Little Calumet and its tributaries has occurred every decade from the 1950s and damaged many areas including sections of State Line and Forest avenues, Hammond’s Woodmar neighborhood, the former Woodmar Country Club that now is Cabela’s, Munster’s Wicker Park Estates and the Woodland Estates area of Highland, as well as Griffith and Gary. At the urging of U.S. Rep. Pete Visclosky, D-Gary, Daniels appointed a new Little Calumet River Basin Development Commission in 2008, led by William Baker, of Munster. That commission took over as the levee project’s local partner to direct local efforts and to operate and maintain the structure it inherited. That new nine-member commission was stipulated in legislation Daniels signed creating a permanent funding source to operate and maintain Little Calumet River flood control levees in Lake County. 091508nbFLOODSFOLLOW09 Natalie Battaglia | The Times MUNSTER - Sue Macut of Munster, grabs clothes from her home on River Drive in Munster after high flood waters reached the top of her basement ceilings. 091508nbFLOODSFOLLOW013 Natalie Battaglia | The Times MUNSTER - Sue Macut of Munster, grabs personal belongings from her home on River Drive in Munster after high flood waters reached the top of her basement ceilings. Sue Macut received help from neighbor Dave Bevil who owns a small boat. 091408tvmFLOOD_5 Tony V. Martin MERRILLVILLE-An emergency crew from Lake of the Four Seasons loads up a personal water craft used in the evacuations to head to a new location. Days of steady rain caused flooding and evacuations in M'ville on Sunday morning. Emergency personnel from various are departments respond for the flood evacuation. Evacuated residents are taken by bus to the M'ville government center ta await friends and relatives. 091508nbFLOODSFOLLOW14 Natalie Battaglia | The Times MUNSTER- Oscar Santos (right) shows video taken by a neighbor who owned a boat and captured images of the floods surrounding their homes on Tapper Avenue, Monday September 15, 2008. 091508jtlFLOODAFTERMATH13 Times Photo | John Luke HOBART Rain that deluged the region throughout the weekend caused more closures and evacuations Monday. The old grist mill at Deep River County Park has significantly more water than normal. 091508jakFLOOD04 Jessica A. Woolf | The Woolf Munster - Chris Spolnick with the Munster Street Department reacts to seeing flood waters as well as the Greenwood levee break in Munster September 15, 2008. 091408jtlFLOOD_FOLO6 Times Photo | John Luke VALPARAISO Cadets from the Valparaiso Civil Air Patrol fill sand bags for residents Sunday at the Emergency Management Center on SR2. The State provided sand for the bags, and the youthes along with inmates from Michigan City Prison DOC provided the manpower to help filling and distributing the bags from center. Jessica A. Woolf | The Times Munster - Police with the DNR pass through flood waters Monday September 15, 2008 looking for residents who need to be evacuated from the rising flood waters. 091508jakFLOOD05 Jessica A. Woolf | The Times Munster - A Munster resident reacts to seeing his house on River Drive for the first time since evacuating from flood water September 15, 2008. 091408VANESSAFLOOD_ Vanessa Renderman | The Times Dyer - Park Manor Drive in Dyer floods again for the second time in a little over a year. 091408jtlFLOOD_FOLO7 Times Photo | John Luke LIBERTY TWP Residents in Harvest Acres subdivision wade through flooded Tiller Drive Sunday as rain continues to flood roads and force evacuations throughout the region. 091508jtlFLOODAFTERMATH5 Times Photo | John Luke HOBART Rain that deluged the region throughout the weekend caused more closures and evacuations Monday, leaving many residents without home from the weekend. Cots are set up in the main room of the Lake Station Boys and Girls Club on Central near west of County Line after the American Red Cross arranged for this and 6 others across the region to accomodate residents who are displaced from the flooding. 091508jtlFLOODAFTERMATH4 Times Photo | John Luke LAKE STATION Rain that deluged the region throughout the weekend caused more closures and evacuations Monday, leaving many residents with no where to stay. Margaret Singleton and Wayne Morris wade through water on 29th near Utah after leaving their home on 30th Monday. Lake Station issued a mandatory evacuation for residents in some areas on the West side. 091508jtlFLOODAFTERMATH11 Times Photo | John Luke HOBART Rain that deluged the region throughout the weekend caused more closures and evacuations Monday. Water in Lake George covers much of the lake front gazebo. 091408tvmFLOOD_10 Tony V. Martin MERRILLVILLE-The playground at Pruzin Park. Days of steady rain caused flooding and evacuations in M'ville on Sunday morning. Emergency personnel from various are departments respond for the flood evacuation. Evacuated residents are taken by bus to the M'ville government center ta await friends and relatives. 091408tvmFLOOD_11 Tony V. Martin MERRILLVILLE-A backyard off of Pierce street. Days of steady rain caused flooding and evacuations in M'ville on Sunday morning. Emergency personnel from various are departments respond for the flood evacuation. Evacuated residents are taken by bus to the M'ville government center ta await friends and relatives. 091508jtlFLOODAFTERMATH6 Times Photo | John Luke LAKE STATION Rain that deluged the region throughout the weekend caused more closures and evacuations Monday, leaving many residents without home from the weekend. Boys and Girls Clubn Director, Donna Gonzalez gives socks to Donnie Demo whose family is staying at the make-shift shelter set up by the American Red Cross Monday. About 70 people had been put up in the shelter by early Monday afternoon with more evacuations expected. gonzalez said that people from teh community were dropping off clothing and other items, commenting that people in Lake Station pull together when things like this happen. 091508jlhFLOODS5 JON L. HENDRICKS/THE TIMES Hobart-Hobart Police Department Maintanance worker Lance Popp talks on his cell phone while keeping an eye on water coming through a sandbag barrier around the lower level of the police department Monday, September 15th. The Lake County Sheriff's Mobile Communications Center truck was brought in and hard wired to take the city's emergency calls while the flood waters from Lake George threatened the Hobart police computer equipment. 091408jtlFLOOD_FOLO8 Times Photo | John Luke HOBART A boat sits on a trailer in the front yard of a home on US51 near 33rd Avenue as water from Deep River rises into the yard, and forces the closure of US51 between US6 and Central Sunday as rain continues to fall throughout the region. 091308jefFLOODING_2 Jeffrey Furticella | The Times Munster - Geese take flight from the flood waters at Wicker Park golf course. 091508jtlFLOODAFTERMATH12 Times Photo | John Luke HOBART Rain that deluged the region throughout the weekend caused more closures and evacuations Monday. Residents rescue a dog from their home near 29th and New Hampshire Monday. 091408VANESSAFLOOD_3 Vanessa Renderman | The Times Dyer - A sign in the Pheasant Hills Park parking lot is partially submerged in flood water. 091408jtlFLOOD_FOLO1 Times Photo | John Luke VALPARAISO Katrina Garcia helps her son, Brazeley(cq)Yokum out of a water-filled ditch along 149 at 130 near the family's home Sunday after Brazely took his bicycle into the water for a picture taken by his grandfather, Javier Garcia. Rain continued into Sunday adding to the swollen river banks and retention ponds throughout the region, forcing the evacuation of homes and businesses, and closing roads throughout the region. 091408tvmFLOOD_12 Tony V. Martin MERRILLVILLE-An SUV tries Pierce street but ends up backing out. Days of steady rain caused flooding and evacuations in M'ville on Sunday morning. Emergency personnel from various are departments respond for the flood evacuation. Evacuated residents are taken by bus to the M'ville government center ta await friends and relatives. 091408jefFLOODS_3 Jeffrey Furticella | The Times Munster - A Munster family peers through the front windows of their home on Broadmoor St. as they watch the flood waters rise. 091508jtlFLOODAFTERMATH8a Times Photo | John Luke HOBART Rain that deluged the region throughout the weekend caused more closures and evacuations Monday. An area of 73rd Avenue between US51 and Colorado collapsed following the rains. Munster residents load up a boat with their belongings as flood levels rose Sept. 15, 2008. 091408tvmFLOOD_1 Tony V. Martin MERRILLVILLE-An Lake of the Four Seasons emergency crew unloads residents they evaccuated with a boat in the 5300 block of Pierce. Days of steady rain caused flooding and evacuations in M'ville on Sunday morning. Emergency personnel from various are departments respond for the flood evacuation. Evacuated residents are taken by bus to the M'ville government center ta await friends and relatives. Matthew Barsic and Cater Vusak walk through chest high water on River Drive Sept. 15, 2008 looking for Barsic's aunt's dog who lives on the street. The two boys were picked up by a volunteer looking for people in need of help. Water covers U.S. 6 between Ind. 149 and Meridian Road as rain continued into Sept. 14, 2008, adding to the swollen river banks and retention ponds throughout the region, forcing the evacuation of homes and businesses, and forcing road closures throughout the Region. 091508jtlFLOODAFTERMATH1 Times Photo | John Luke LAKE STATION Rain that deluged the region throughout the weekend caused more closures and evacuations Monday, leaving many residents with no place to stay. Residents stand on their front stoop as their home is surrounded by water on 29th near Oklahoma Monday as emergency workers for Lake Station went house to house in boats evacuating residents in the area. 091408jefFLOODS_11 Jeffrey Furticella | The Times Munster - A bird feeder overflows with rain water as flood water rises on the street behind it. 091408tvmFLOOD_6 Tony V. Martin MERRILLVILLE-Evacuated residents are welcomed at the M'ville Government Center. Days of steady rain caused flooding and evacuations in M'ville on Sunday morning. Emergency personnel from various are departments respond for the flood evacuation. Evacuated residents are taken by bus to the M'ville government center ta await friends and relatives. 091408jtlFLOOD_FOLO4 Times Photo | John Luke HOBART Water from Deep River covers US51 at 33rd as rain continues into Sunday adding to swollen rivers and water basins throughout the region. 091408jtlFLOOD_FOLO5 Times Photo | John Luke VALPARAISO A Valparaiso fire truck broke through a culvert, and fell into a small sinkhole on Horseprairie just south of US30 Sunday. Rain continued into Sunday adding to swollen rivers and rentention ponds forcing road closures, and evacuations of homes and businesses in the region. 091508jtlFLOODAFTERMATH10 Times Photo | John Luke HOBART Rain that deluged the region throughout the weekend caused more closures and evacuations Monday. Hobart's Brickie Bowl was completely underwater. 091408jefFLOODS_15 Jeffrey Furticella | The Times Munster - Sandbags are stacked to form a wall in preparation for the possibility of flood waters rising over the Northcote Avenue bridge. 091508jtlFLOODAFTERMATH2 Times Photo | John Luke LAKE STATION Rain that deluged the region throughout the weekend caused more closures and evacuations Monday, leaving many residents without a place to stay. Nina Mitchell, 16 talks with Ramon Durr, 13 while they sit on cots in the Boys and Girls Club one Central near Wayne Streets Monday after being evacuated from their homes. 091508ggAERIAL_HIGHLAND4 Gregg Gearhart | The Times Highland -- Wicker park golf course floods after the Little Calumet river over flowed its banks. 091408tvmFLOOD_3 Tony V. Martin MERRILLVILLE-Firemen in a boat work with a man with a stalled vehicle on the 5300 block of Buchanan Street. Days of steady rain caused flooding and evacuations in M'ville on Sunday morning. Emergency personnel from various are departments respond for the flood evacuation. Evacuated residents are taken by bus to the M'ville government center ta await friends and relatives. 091508ggAERIAL_HIGHLAND2 Gregg Gearhart | The Times Highland -- Wicker park golf course floods after the Little Calumet river over flowed its banks. 091408jtlFLOOD_FOLO3 Times Photo | John Luke VALPARAISO Cadets from the Valparaiso Civil Air Patrol fill sand bags for residents Sunday at the Emergency Management Center on SR2. The State provided sand for the bags, and the youthes along with inmates from Michigan City Prison DOC provided the manpower to help filling and distributing the bags from center. 091308jakFLOOD02 Jessica A Woolf | The Times MUNSTER - The Little Calument river along Hawtrone Drive was passed flood stage Saturday September 13, 2008 after days of rain drenched the region. 091508jtlFLOODAFTERMATH3 Times Photo | John Luke LAKE STATION Rain that deluged the region throughout the weekend caused more closures and evacuations Monday, leaving many residents with nowhere to stay. Peter Long, of Lake Station sits outside the Boys and Girls Club with his family's dogs, Duke and Molly. Without cages, the animals can't be inside the shelter. Long and his fiance, Christine Caine, and her daughter, Ashley, 9 were evacuated from Lake Station's West Side. "We lost our truck, we lost everything," he said. 091508jtlFLOODAFTERMATH8 Times Photo | John Luke HOBART Rain that deluged the region throughout the weekend caused more closures and evacuations Monday. An area of roadway 73rd Avenue near Dekalb between US51 and Colorado collapsed following the rains. 091408tvmFLOOD_9 Tony V. Martin MERRILLVILLE-A partially submerged pick-up on Pierce. Days of steady rain caused flooding and evacuations in M'ville on Sunday morning. Emergency personnel from various are departments respond for the flood evacuation. Evacuated residents are taken by bus to the M'ville government center ta await friends and relatives. 091508ggAERIAL_LANSING1 Gregg Gearhart -- The Times Lansing -- Lansing airport runways just above the flood waters. 091508ggAERIAL_HIGHLAND5 Gregg Gearhart | The Times Highland -- Wicker park golf course floods after the Little Calumet river over flowed its banks. 091408jefFLOODS_18 Jeffrey Furticella | The Times Munster - Hammond police officers survey the early signs of rising flood waters along the Columbia Avenue bridge. 091508jtlFLOODAFTERMATH9 Times Photo | John Luke LAKE STATION Rain that deluged the region throughout the weekend caused more closures and evacuations Monday. Lake Station emergency workers evacuatedd residents from the West side near 92th and Oklahoma Monday. 091408jefFLOODS_17 Jeffrey Furticella | The Times Hammond - Sandbags are stacked on a Hammond Public Works truck trailer in anticipation of flood waters rising over the Columbia Avenue bridge. 091508ggAERIAL_HIGHLAND3 Gregg Gearhart | The Times Highland -- Wicker park golf course floods after the Little Calumet river over flowed its banks. 091508jtlFLOODAFTERMATH7 Times Photo | John Luke HOBART Rain that deluged the region throughout the weekend caused more closures and evacuations Monday, leaving many residents homeless. The bridge over Lake George on 3rd Avenue near Main Street was damaged by water washing away soil underneath the road. 091408tvmFLOOD_13 Tony V. Martin MERRILLVILLE-A submerged car on 54th Ave. Days of steady rain caused flooding and evacuations in M'ville on Sunday morning. Emergency personnel from various are departments respond for the flood evacuation. Evacuated residents are taken by bus to the M'ville government center ta await friends and relatives. 091508ggAERIAL_LAKESTATION2 Gregg Gearhart | The Times Lake Station -- Lake Station between 27th and 29th flood after the Deep river over flowed its banks. 091408tvmFLOOD_4 Tony V. Martin MERRILLVILLE-A man wades in knee-deep water in his front yard to recue items from drifting away. Days of steady rain caused flooding and evacuations in M'ville on Sunday morning. Emergency personnel from various are departments respond for the flood evacuation. Evacuated residents are taken by bus to the M'ville government center ta await friends and relatives. 091408jefFLOODS_20 Jeffrey Furticella | The Times Munster - Emergency crew workers survey the rising flood waters on the Columbia Avenue bridge from behind a large dirt safety wall. 091408tvmFLOOD_8 Tony V. Martin MERRILLVILLE-After their family was evacuated from the 5900 block of Grant Street, Benzi, 4, and Beah 5, Corrales play while waiting. Days of steady rain caused flooding and evacuations in M'ville on Sunday morning. Emergency personnel from various are departments respond for the flood evacuation. Evacuated residents are taken by bus to the M'ville government center ta await friends and relatives. 091408tvmFLOOD_7 Tony V. Martin MERRILLVILLE-Evacuated residents Ann and Edward Bubas wait at the government center before jheading to a motel for the night. Days of steady rain caused flooding and evacuations in M'ville on Sunday morning. Emergency personnel from various are departments respond for the flood evacuation. Evacuated residents are taken by bus to the M'ville government center ta await friends and relatives. 091408jefFLOODS_5 Jeffrey Furticella | The Times Munster - A car is almost completely submerged in flood water on a Munster neighborhood street. The urgent care unit of the Hammond Clinic admitted 6 feet of water the Sunday of the 2008 flood. A system of flood walls was supposed to be in place to prevent flooding when record rainfall hit Sept. 12, 2008. A stretch of Ind. 8 in LaPorte that was closed during historic flooding in February has finally been reopened. Construction workers in Northwest Indiana are wearing pink for a good cause. It's not necessary to head up to some arthouse in Chicago to see the latest in world cinema. People can go on a hike this spring to learn about the Underground Railroad's history in the Calumet Region.